In the Bronze Age, technology existed but knowledge was probably gained by experience and passed on by tradition. Nevertheless, extensive, if small-scale, industries existed and the techniques in use at Alderley Edge were probably linked historically with those developed elsewhere in the Middle East. The description on this page is based partly on findings at Alderley Edge and partly on archaeology in the Middle East. The ore being processed at the time was most probably the rich malachite and azurite secondary deposits found close to the surface. Such deposits have been studied in detail at Timna in what is now Israel where the miners were digging for nodules of malachite in fairly soft sandstone, similar to Alderley Edge. They used hafted stone hammers and dug vertical shafts connected by galleries such as may have existed at Engine Vein and Brynlow. At Timna, the shafts and galleries were rather haphazard, presumably following rich ores without any overall plan. The ore was prepared for smelting by pounding with stones to produce a powder of copper carbonate (malachite and azurite). Ore preparation was important so as to expose as much of the ore as possible to the process. The ore was mixed with charcoal and placed into bowl-shaped furnaces, usually with a clay layer lining. Air was blown into the furnace and goat-skin bellows may have been used as these are illustrated in Egyptian tombs of the period. Other types of bellows include ceramic pots with leather tops which were lifted and lowered by the operator. Experience at Alderley shows the blowing to be the most strenuous part of the process. Experiments show that these furnaces reached temperatures between 1180? to 1350?, which could only have been achieved with some forced draught other than natural wind currents. The furnace would have produced rather impure masses of metal that needed further cold working by hammering, or a further firing to produce much purer copper ingots. 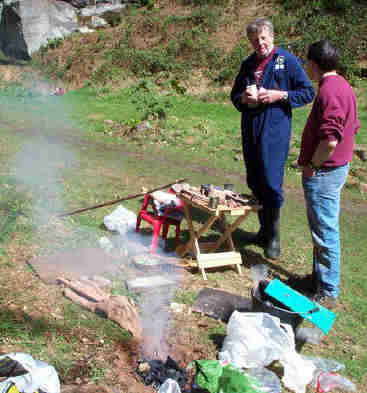 Experiments have been carried out at Alderley Edge to prove the technology and the picture shows two DCC members at an Open Day when copper was produced from local ore using charcoal and a hand bellows. To speed up the process, a mechanical blower was introduced. Hearths have been found at Alderley Edge along the side of Engine Vein during the Landscape Project excavations. These were excavated by Simon Timberlake and dated by carbon dating to around 1900 BC. The report on this excavation forms part of the archaeological book about Alderley Edge. The copper from the first smelting would be impure and contain a lot of gas. To make copper tools and artefacts, the miner would either remelt the copper which would remove gas and allow slag to be scraped off the surface of the crucible or would hammer it into shape. Copper hardens when hammered so the smith would need to heat and cool (anneal) it from time to time to restore its softness. Making bronze requires the alloying of copper with tin or arsenic. Tin was not present at Alderley Edge but some arsenious ores such as enargite (copper arsenic sulphide) are present and it has been speculated elsewhere that the addition of these to the smelting process could have led to the manufacture of bronze. It has been found that adding iron ores to copper smelting helps as the iron ore acts as a flux, reducing the temperature required in the furnace so if an iron arsenic ore or similar had been added, the arsenic may be alloyed with the copper producing the characteristics of bronze. We believe that much remains to be researched on the Bronze Age period, for instance, where was the copper processed? where did it go? was bronze made at Alderley Edge? etc. Some of this research is already going on but more will be needed in future.